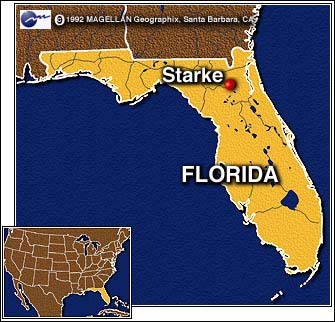 Directions: From East: SR-16, 11 miles west of Starke on left. From North (Macclenny): SR-121 south approximately 17 miles to SR-16 (before town of Raiford). Turn left onto SR-16. Go approximately 2 miles. The Institution is on the right. From West (Lake City): SR-100 approximately 23 miles to SR-121 (Lake Butler), turn left. Go approximately 6 miles. Just outside town of Raiford turn right (east) onto SR-16. Go approximately 2 miles. The Institution is on the right. The West Unit was constructed in 1935 to house female offenders. However, in 1954, Florida Correctional institution was opened, and the female inmates were transferred from the State Prison Farm to that facility. The West Unit was then converted to the reception and medical facility until 1968 when the Reception and Medical Center opened at Lake Butler. In 1955, the Old Administration Building was constructed, and in 1955, a maximum security facility was constructed on the Bradford County side of the property, and designated the "O" Unit. This building was named the East Unit. In 1958, construction of a "modern architecture" 1175 bed maximum security unit was constructed alongside the "O" Unit, which together, became the East Unit. In 1961, Death Row inmates and the electric chair were moved to the East Unit. In July of 1972, the East Unit became a separate institution and was renamed Florida State Prison. The original Florida State Prison became Union Correctional Institution. In 1975, a "modern" new housing area, consisting of thirteen separate units, was constructed and designated the Southwest Unit. In 1985, the Southeast Unit was completed and "the Rock" was simultaneously closed by federal court order. In 1992, a new death row housing unit was built and inmates relocated from Florida State Prison. Currently Union C.I. houses 1,737 adult male inmates. The facility accepts minimum, medium, close, maximum custody and all medical grade inmates. Academic and self-betterment programs are provided.